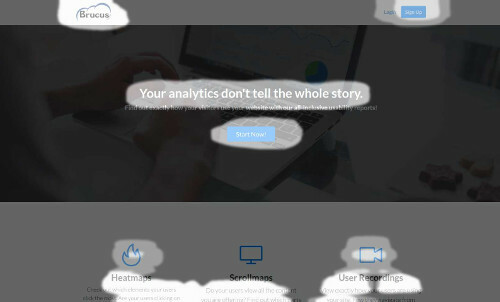 Brucus Analytics - Website Heatmaps, Recordings, Funnels, etc. Your analytics don't tell the whole story. Find out exactly how your visitors use your website with our all-inclusive usability reports! Check out which elements your users click the most. Are your users clicking on things that are not links? Find out and make your content more engaging. Do your users view all the content you are offering? Find out which parts of your pages are not seen by your visitors. View exactly how your users are using your site, how they navigate from page to page and discover any usability issues that may prevent your visitors from converting. What is the abandonment rate of your forms? Which field makes your visitors not complete a form? Find out and maximize your conversions. Websites are usually designed to encourage visitors to navigate through them in certain ways. Find out how your visitors navigate your site. Find out where your visitors are abandoning your site. Identify the best pages for testing and improvement. Which elements of your page draw your visitors' attention in the first few seconds of their visit? With the Attention Prediction Maps you can leverage machine learning to test and iterate your designs immediately! Monitor your website and server availability issues. Get notified instantly via email or SMS. Check server and website loading errors, DNS records and HTTPS certificates. What prevents your visitors from converting? Find out how your users behave and what keeps them from converting. Also, identify on which elements your visitors click the most. Are your visitors clicking on elements that are not links? Find out and make your content more engaging. Which traffic sources produce the most conversions? Where are your visitors abandoning your site? What is the exit rate of each of your pages? Find out exactly how your visitors are navigating your website, how they navigate from page to page, what are they clicking and identify issues that may prevent them from converting. Simply create an account and add a small script to your website to start generating your usability reports. No hassle, no coding required! Click Heatmaps & Scrollmaps for all pages of your site. Analytics of all of your forms. How many interactions, submissions, etc. Chart of the user behaviours across your site. Performance statistics (how many seconds for users to connect, load and display your website) for your whole site and each page. Access to all user recordings to have the whole picture. © Brucus 2019. All Rights Reserved.